US Secretary of State Condoleezza Rice has delivered a forceful call for democratic reform in the Arab World in a major policy speech in Cairo. The US pursuit of stability in the Middle East at the expense of democracy had "achieved neither", she admitted. "Now, we are taking a different course. We are supporting the democratic aspirations of all people," she said. The BBC's Frank Gardner said her comments marked a complete departure for the US, and were "immensely risky". She criticised Egypt and Saudi Arabia, where she arrived after leaving Cairo, for cracking down on dissenters. She also called on Egypt to ensure its upcoming election was free and fair. Our security correspondent says the remarks not only risked alienating Cairo and Riyadh - by making such calls for democracy the US could open the way for more Islamist governments. 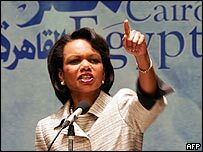 In her speech at the American University in Cairo, Ms Rice referred to US President George W Bush's second inaugural address, in which he said his aim was to help people find their democratic voice and not to impose a US-style government on them. "For 60 years, my country, the United States, pursued stability at the expense of democracy in this region, here in the Middle East, and we achieved neither," she told an audience that included government officials and academics. "Throughout the Middle East the fear of free choices can no longer justify the denial of liberty," Ms Rice said. "It is time to abandon the excuses that are made to avoid the hard work of democracy." Ms Rice praised Egypt's President Hosni Mubarak for allowing a contested presidential election later this year, but called for international monitors to be allowed to observe the poll. She also said she worried about the future of reform in the country because peaceful opponents of the government had been subjected to violence. "President Mubarak has unlocked the door for change. Now, the Egyptian government must put its faith in its own people," she said. She welcomed Saudi Arabia's recent elections but alluded to the exclusion of women by saying democracy was for both sexes. And she criticised the jailing of three peace activists in Saudi Arabia who had petitioned for change. "That should not be a crime in any country," she said, ahead of her visit to Riyadh. Opposition groups also had to play their part, renouncing violence and accepting the results of elections, she said. Analysts say the new US emphasis on reform has made it possible for opposition movements in the region to act more boldly. In Egypt, the independent press has become openly critical of the president and a new movement has emerged calling on him to relinquish power. Earlier, Egyptian Foreign Minister Ahmed Aboul Gheit promised his country's presidential election, planned for September, would be free and fair. "Who would object to fair and transparent elections?" he said. "It will be so, I assure you."